Texas’ anti–sanctuary city bill SB 4 is very, very unconstitutional. Why a judge blocked the most controversial provisions of Texas’ anti–sanctuary city bill. 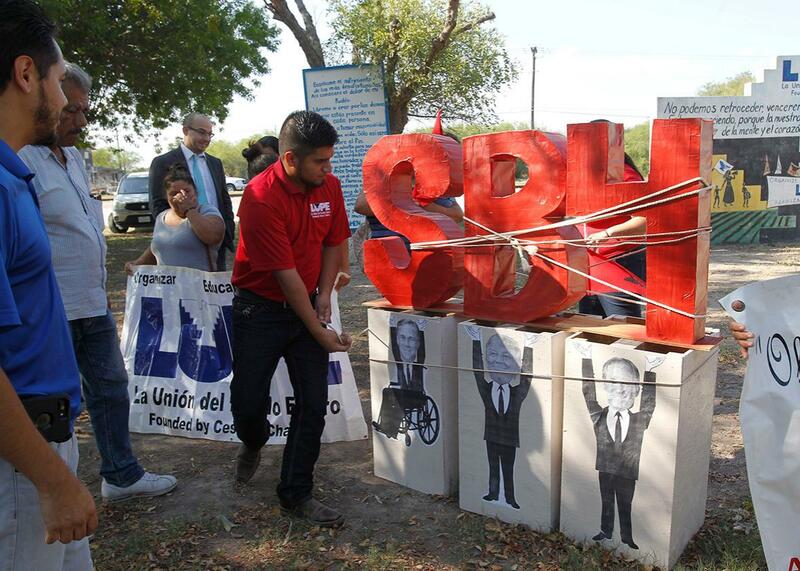 LUPE (La Union del Pueblo Entero) members rope off a cardboard sign indicating SB 4 has been temporarily blocked by a judge on Thursday in San Juan, Texas. On Wednesday night, U.S. District Judge Orlando Garcia blocked major portions of SB 4, Texas’ assault on “sanctuary cities.” The Republican-backed measure requires local police to enforce federal immigration law, cooperate with federal immigration officials, and detain individuals suspected of being undocumented. It also gags local officials from speaking out against SB 4 or federal immigration enforcement; those who do are subject to massive fines and removal from office. Garcia found that major provisions of the law likely violate the United States Constitution’s guarantees of free speech, due process, and freedom from unreasonable searches or seizures. He also ruled that federal law pre-empts SB 4’s most controversial components. Garcia’s decision is a significant blow to the Republican-led effort to coerce local governments into joining President Donald Trump’s crackdown on undocumented immigrants. On Thursday, I spoke with Lee Gelernt, the deputy director of the American Civil Liberties Union’s Immigrants’ Rights Project who represented some of the plaintiffs challenging SB 4, to explore the potential influence of the ruling. Our conversation has been edited and condensed. The Trump administration argued that SB 4 did not conflict with federal law. Does that matter? No. SB 4 conflicts with congressional statutes. It’s Congress that decides what the states can do, and Congress did not allow for a law like SB 4. The Trump administration cannot dictate the meaning of federal law. That’s why the court wrote that SB 4 would “inevitably lead to Fourth Amendment violations”: Officials are forced to honor groundless ICE detainers, leading to unlawful detentions. What impact do you think this decision will have outside of Texas? Obviously, other states are constantly thinking about passing anti-immigration measures, and they’re looking to see what happens with SB 4. But the issues with SB 4 really go beyond immigration. One principal legal issue is the relationship between a state and its political subdivisions, like towns and counties. That’s playing out beyond immigration. You see conservative state legislatures trying to pre-empt local governments from protecting a vulnerable group: a racial minority, LGBT people, low-income workers, and so on. A lot of people are watching SB 4 very closely for reasons unrelated to immigration as more conservative states try to pre-empt local officials’ ability to protect their own vulnerable communities.